Sorry for the sporadic posts, but life happens and I haven't had too much time in the kitchen lately. I did manage to make some cupcakes for another co-workers birthday, so I thought I would share them with you. I post more often on Instagram, so follow along if you like. You can find me @meandmypinkmixer. I am really loving the addition of pudding in the last few cupcake recipes I have made. I used it last in my Pistachio cupcakes and was really impressed with the results. This time I even used pudding in the frosting! 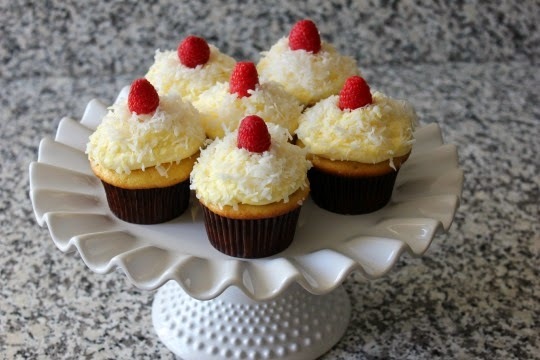 Overall I was really pleased with how these coconut cupcakes turned out. I don't bake with coconut very often, so they were a nice change of pace. Preheat oven to 350 degrees and line cupcake pans with paper liners. Prepare cake as directed on box with eggs, oil and water, adding 2/3 cup coconut, 1/4 cup milk and dry coconut cream pudding mix. Using a large cookie scoop, fill cupcake liners. Bake for 18-20 minutes or until tops spring back when lightly touched. With a wire whisk, beat vanilla pudding mix, powdered sugar and milk for about 2 minutes. Fold in whipped cream. Refrigerate until ready to frost cupcakes. To frost cupcakes, I spooned the cold pudding frosting into a piping bag with a round tip. 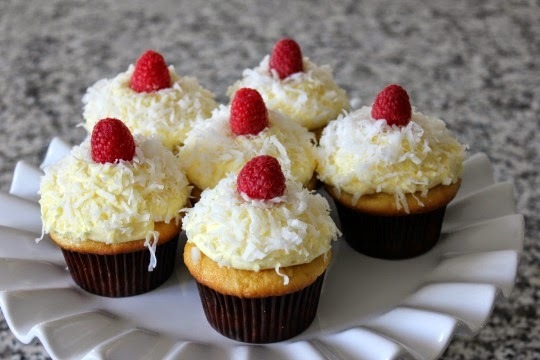 Pipe frosting onto cooled cupcakes and sprinkle heavily with coconut. Top with a fresh raspberry or other fruit. Store leftover cupcakes in the refrigerator.